Carol and Jim Short have collected over 50 boxes already. 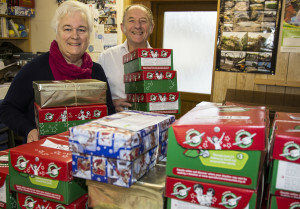 OPERATION Christmas Child is under way and shops in Frome are collecting gift-filled shoeboxes on behalf of international relief charity Samaritan’s Purse. Shoe Zone and Frome Valley Cleaners will be collecting the Christmas packages throughout November. You can pick up shoeboxes to use from Shoe Zone situated in the Market Place and return them for collection after they have been packed. Frome Valley Cleaners are using the Clink Evangelical Church behind the shop as a drop off point. Frome residents are encouraged to fill shoeboxes with new toys, stationery, small clothing and hygiene items which will be sent to children living in refugee camps, orphanages and impoverished neighbourhoods around the world. Supervisor at Shoe Zone Suzanne Lanfear said, “We act as a drop off point every year and are always more than happy to help. “It’s a great idea because it gets children involved as they can help decorate the box and decide what goes in it. People making donations are asked to indicate whether their shoebox is intended for a boy or a girl, as well as their age category – two to four-years-old, five to nine, or ten to 14. Examples of things that can be included are cuddly toys, tennis balls, small musical instruments, toy cars, dolls, pens, pencils, colouring books, stickers, toothbrushes, hairbrushes, soap, sweets, gloves, and hats. No sharp, easily breakable, or war-related items. For a full list of what is suitable to include or for more information go to www.samaritans-purse. org.uk. Shoe Zone is at 22/23 The Market Place, Frome, BA11 1AN and is open from 9am to 5.30pm Monday – Saturday and 10am to 4pm on Sunday. Clink Evangelical Church is situated on Clink Road, Frome, BA11 2EN, open from 8am to 5.30pm Monday – Friday and 9am to 1pm on Saturday. You can also drop boxes off at the warehouse in Southwick which is at Unit 16, Dunkirk Business Park, Frome Rd, Southwick, Trowbridge, BA14 9NL and is open from 10am to 4.30pm Mon – Sat. If you would like to help sort the boxes, please call Steve Lloyd on 07715 843872.